The Pausa with a capital P is a simple but highly effective “tool” in all learning processes. 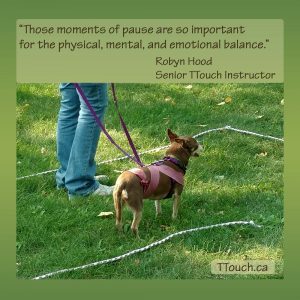 When we pause, we give the animal the chance to process and assimilate the recent experience in order to learn from it. Sometimes we will find that after the pause a task which previously seemed impossible will simply flow simply because we gave the animal time to “regroup” rather than forging ahead at all costs. When we work respecting the pace of each individual we can go further more quickly. As Napoleon once said, “Dress me slowly because I am in a hurry”.